Machined Aluminum, Hardened Steel Jaws and Anodized Finish! Really! For a pair of nippers?! I remember laughing at the idea. I'm not laughing now! Sales are proof that we are running out of fancy fly fishing things to spend our money on. 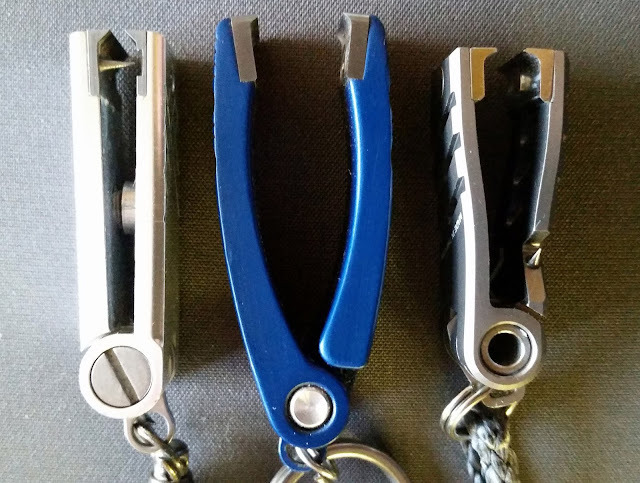 But I must confess these cnc machined aircraft grade aluminum, hardened stainless steel and anodized to perfection nippers really are better then the ordinary standard nipper. Like many over the top items first deemed as unnecessary somehow become standard when you find yourself resistant to ever go back to ordinary once you have experienced better. The three pictured are in fact my own personal nippers and while I use the excuse I needed them all for testing and reviewing, (sigh), truth is I like them! Read on and I'll tell you why. These are the second generation Simms nippers now known as Guide Nipper. Much improved over the first gen model. I noticed quickly that the machined cuts on the grip surface are very un-refined or un-polished leaving me to think it was a cut corner but upon using them I realized that the raw aluminum cuts actually added a great deal of grip. Just like aluminum on wading boot soles, they cut through and grip. I must admit being somewhat a minimalist I appreciate the compact feel of these nippers and the Titanium finish I chose to go with provides a very disguise non-flashy look. If you need more color in your life then they also come on Simms Orange and Surf Blue. I have to give Abel Lanyard the vote for originality. The design is something an obsessive angler could vision up from a weeks worth of unorganized piled up terminal tackle. While it appears unnecessary the big ball bearing swivel clinches the deal for me in both form and function with an added over-kill benefit of your nippers always laying flat against your chest. 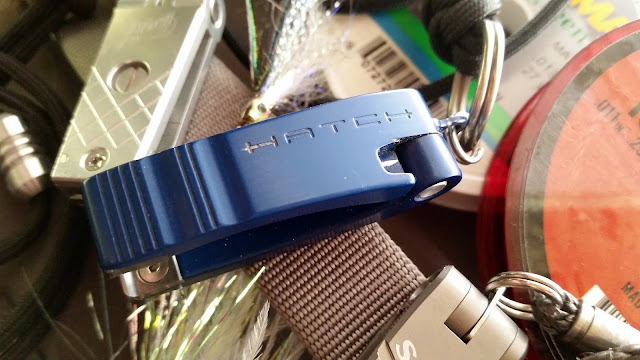 The Hatch Lanyard is simple and effective with best feature being that it is automatically included with their Nippers. Simms obviously realized the importance of a quality lanyard and did a nice job in closely replicating the others. While paracord is readily available it surprises me no one took the FlyVine, fly line re-purpose route. 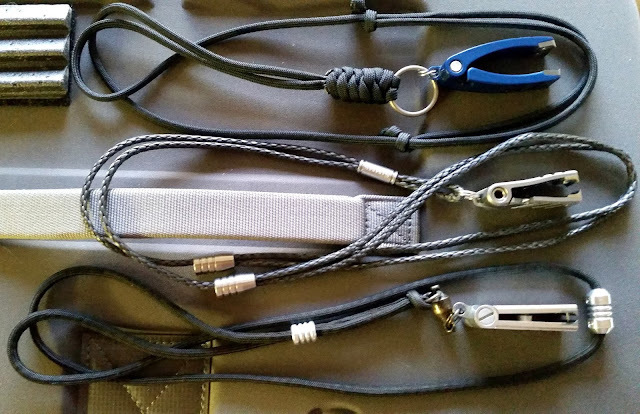 As for the swivel, I'll be adding this feature to my other lanyards. This angle really shows just how slim the Abel Nippers are. I appreciate their compact design. I have heard some say they prefer the Hatch Nippers for their wide opening ease of use. I can see that side. Simms keeps theirs compact but not the same slim feeling of the Abel's. Notice the piercing looking eye buster on the Simms. Something I never noticed until doing this review...The hatch attachment point is machined as part of the aluminum arm. My only concern with this is aluminum wears easily and it's such a small flange I could see in some strange mishap getting broken off. I've yet to ever hear of a problem, just my observation. The other two appear to be Stainless Steel and are free moving. I did some nip testing. Of course all of them cut whatever nylon or fluorocarbon tippet/leader material you could throw at them. I couldn't really tell a difference in cut quality or effort to operate. I also tested them with cutting braid material. Braid is tough for anything to cut cleanly. All three Nippers managed to cut any braid I tried but none of them really nips it cleanly unless you pull the braid line across or against the cutting edge of the nippers. Then they all did a pretty good job. I feel the Abel Nippers with having both jaws sharpened may have had a slight edge over the others. It's really hard to determine and I think cutting braid may have as much to do with technique as anything else. This is where I do my best not to show bias. Yeah Right! You'd think I'd know by now there is no such thing as a non-bias review. I think it's hard to beat the Abel Nippers. The design, originality, finish and ergonomics all are about as perfect as it gets. The only thing I can knock them for is the ever increasing price. I can easily see why the Hatch Nippers appeal to many anglers with a larger size and larger opening for ease of use. Even though I prefer smaller nippers to appease the minimalist in me, I can't really knock Hatch for their size because they appeal to those who prefer bigger. Nothing wrong with that. Hatch provides a great looking quality alternative choice in Nippers. 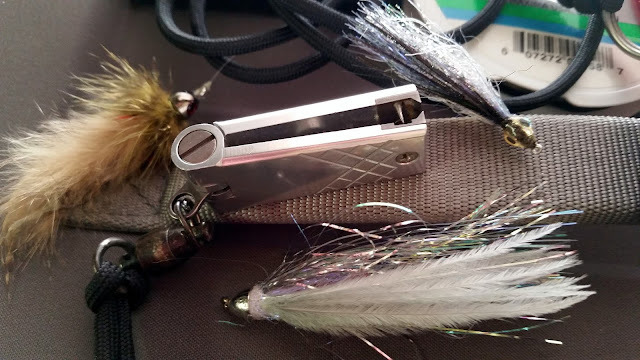 Steep at $100 but don't forget when comparing, Hatch Nippers include the Lanyard. 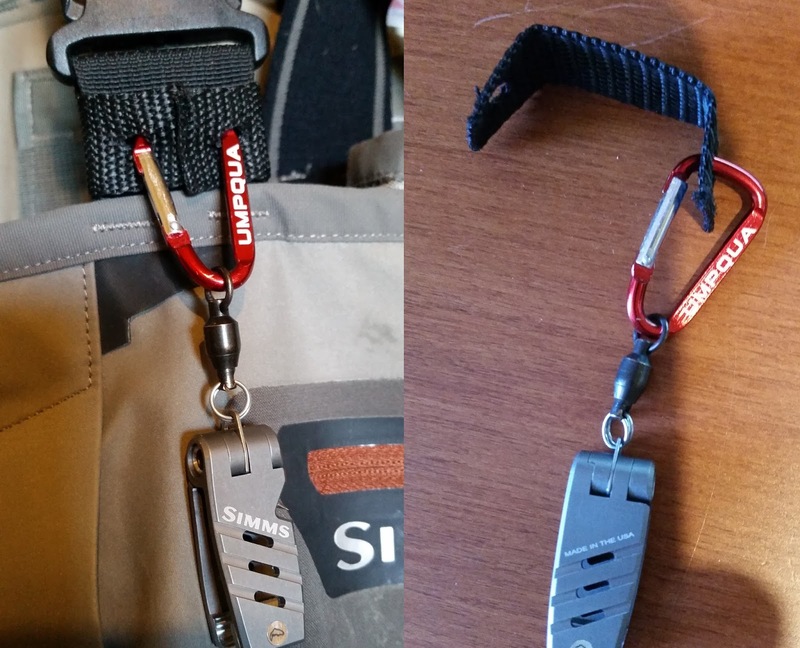 The New Simms Guide Nipper is several steps of improvement over their original nipper entry which just didn't Nip it! HaHa! I think they appeal to those who want the premium style nipper but draw a line at a price point. Time to "Nip it in the Bud"
In reference to comments here is pictures of what I do to attach my nippers. I do use a lanyard at times. 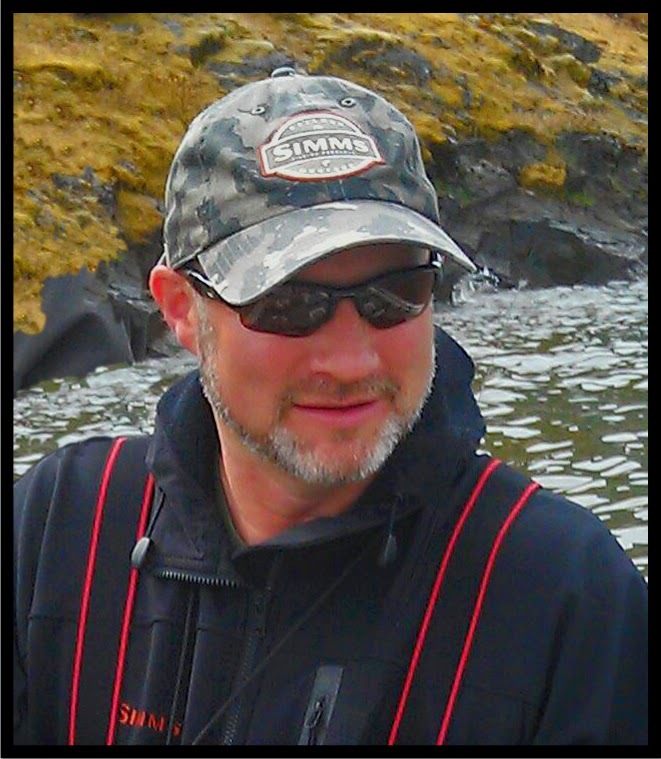 If I use a lanyard it is usually summer fishing from a boat, with no waders on. My rule of thumb is no more then one item around neck. Notice to avoid piercing a hole in my wader strap I devised a little loop of webbing. Also notice (pay attention Simms) the already ripped out integrated utility tab, yeah, not so secure. 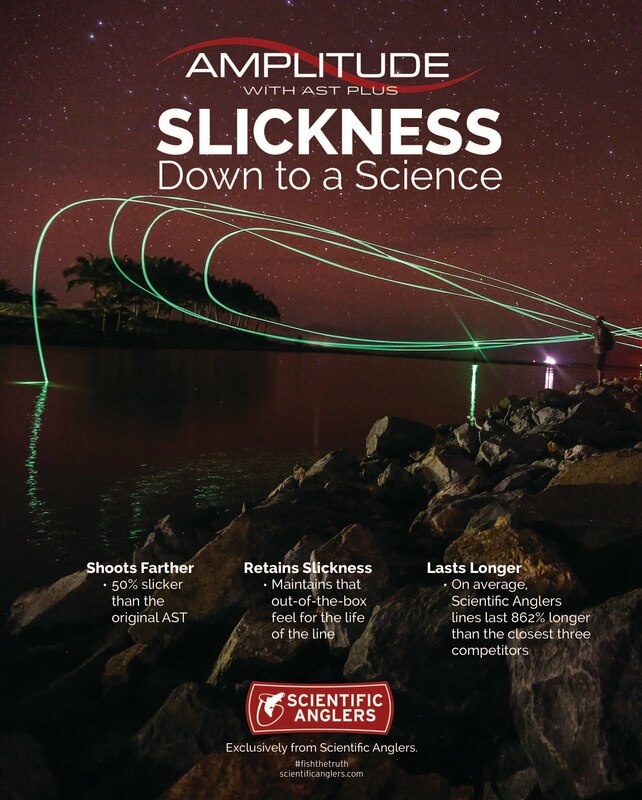 Redington had the best thing going on their Sonic Pro waders with an actual D-rings attached solidly on both suspenders but when they brought out the new 2017 model it was MIA. What a shame! With the carabiner I have the option to move them wherever I want them or store them away in my pack and feel pretty secure that I am not going to lose them to a faulty intrusive zinger. Great review. I have the Abel nippers but am slightly worried about losing them due to the cost. 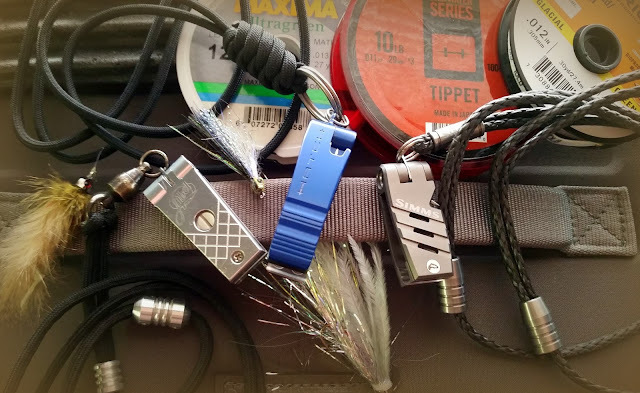 My worry is around preferring a zinger to a lanyard and I've had quite a few zingers either come lose, wire snap or just fall off never to be found again. Any recommendations for a really solid zinger that can be relied upon? Would love to see that review. Thanks for taking the time to read my review. I do have some thoughts on zingers, I don't like them! lol...and for all the same reasons you mentioned. The Abel Zinger is pretty fancy but not my style or acceptable price range. 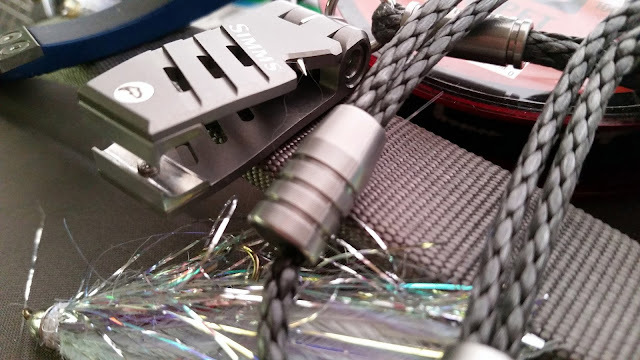 I almost like the coil cord type such as the simms but they still have a terrible pin style attachment point that leaves holes in your gear and pierces your fingers when attempting to attach. The fishpond zinger may be considered due to its heavy pin and spring load detention and the way in which it allows a freedom of 360 degree movement. I understand the lanyard issue...with a buff around your neck, and a sling pack strap now add a lanyard and at some point you are going to accidentally strangle yourself. I think I have a time or two! What I should have mentioned in my review is what I use most of the time especially when wearing waders. I use a small carabiner and attach to my waders or my pack. I'll shoot a picture and load it in this post. That seems to work well for me. I have piece of mind that I wont lose them, Easy to switch between different needs and not too dangly feeling. Thanks, and we'll put that zinger review idea on our blog list. Hi I have the Abel and the first generation Simms nipper along with the standard sprung steel nipper. I fish small streams over here in England and in doing so, my fly sizes are mostly 20's and the major gripe I have with the Abel and Simms, other than the cutting quality of the Simms. is the hook eye cleaner isn't good for the size of fly I use and the Abel is difficult to access with small flies being tucked away inside the jaws. However the simple nipper has an excellent hook cleaner albeit not as longer lasting cutting edge. I am now looking at the new Orvis nipper which has moving hook cleaner, although the Hatch nippers with lanyard look good too! I'm just 'old school,' I guess, but why would pay $75.00 for what are glorified toe nail clippers? That aside, they do look like a cool bit 'o-kit. Is there any Nipper that cut rio wire bite of 20 lb? Great Question. I'm going to go with NO! 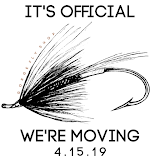 I'm not saying they won't but none of the manufacturers will lay claim that they will cut wire bite tippet. Now with full disclaimer in place and I happen to have a spool of rio 20lb wire, and here is the results I came up with. The Abel nippers cut through just fine. The Simmms did not cut through and I didn't force them too. My Hatch nippers are currently not available for me to test. Considering the Hatch have tungsten carbide blades it shouldn't be a problem. But, we have to remember the Abel nippers have an advantage of both blades are sharpened and aligned for cutting. other nipper brands use the one sharp, one anvil type of system for cutting.